Welcome home to this 2-bed, 2-bath condo in the University area! Enjoy an open-concept kitchen/dining/living area in a first-floor end unit with plenty of natural light. Both bedrooms have attached bathrooms, making this an ideal situation for roommates, families, or hosting guests! You'll love the new engineered bamboo flooring and neutral palette as a backdrop for your home. The HVAC system was completely replaced in June 2018 with a 10-year warranty. 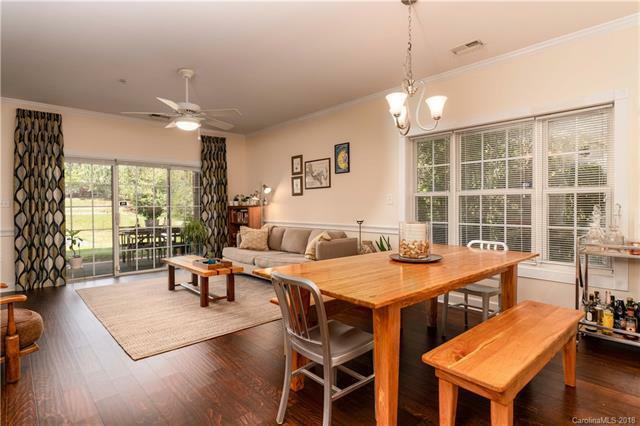 Located minutes from UNCC, Lynx Blue Line extension, Greenways, IBM Drive/Research Park, I-85, and I-485, Carolinas HealthCenter System University, dining, shopping, and more! Spend your summers in the community pool, which is conveniently just steps from the covered back porch. Exterior maintenance and lawn care included in HOA fees. Units in this neighborhood regularly rent for around $1000/month.